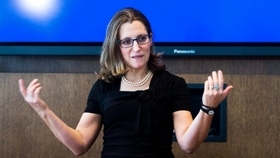 Foreign Affairs Minister Chrystia Freeland says Canada has done some "creative thinking" about how to deal with "unconventional" U.S. proposals. Canada is hosting an annoyed and angry United States as the sixth round of talks in the North American Free Trade Agreement renegotiation unfold between Jan. 21 and 29. The Trump administration is making known its displeasure about Canada's contributions to date and demanding progress over the marathon 10-day session. Multiple sources aware of the U.S. administration's views say the acrimony has a variety of causes, including Canada's recent decision to file a sweeping complaint about U.S. trade practices at the World Trade Organization and its pursuit of a progressive trade agenda that includes Indigenous and labour provisions. The rhetoric around its implacable rejection of the most controversial U.S. positions — raising continental content provisions on automobiles, scrapping a dispute resolution mechanism, limiting Canadian access to U.S. procurement, and instituting a five-year sunset clause — as well as bitterness over apparent leaks are all fuelling the U.S. animosity towards Canada, say sources. Sources familiar with the Canadian position dismiss all that and say the tone at the negotiating table is professional and cordial, and that Canada is prepared to table counter-proposals in order to make progress. They say Canadian negotiators are making constructive proposals to find common ground with the Americans on what some have called poison pills designed to kill the deal. Indeed, Canada, the United States and Mexico are showing signs they all want to see tangible progress in this round in order keep the negotiations on track, and discourage U.S. President Donald Trump from announcing his intent to withdraw from NAFTA. It won’t be until Jan. 29 that Foreign Affairs Minister Chrystia Freeland, American counterpart Robert Lighthizer and Mexico's Ildefonso Guajardo arrive in Montreal to close the extended round that got underway earlier than planned on Jan. 21. The way some see it, Lighthizer is in no hurry to come back to Canada. "The feeling of ill will between Bob Lighthizer's office and the Canadians — I don't think you can underestimate it," said Sarah Goldfeder, a former U.S. diplomat who now represents American clients in an Ottawa consultancy. "He's extremely frustrated with China and Canada," added Goldfeder. "Those are the two countries he thinks are being most unfair to the United States. Those are the ones taking up a good chunk of his time, and not in positive ways." Goldfeder noted that when Freeland went to Washington eariler in January she met Commerce Secretary Wilbur Ross and members of Congress — but not Lighthizer. When Guajardo visited later in the month, Lighthizer's door was open to him, she said. Freeland's office didn't reply to a request for comment on the lack of a meeting with Lighthizer. Colin Robertson, a retired diplomat with extensive experience in the United States, said the body language between Lighthizer and Freeland is "terrible," which is telling. "He's a bully and she gets under his skin," said Robertson. "She and Guajardo are amigos. No one would say that about Freeland and Lighthizer." Lighthizer isn't willing to blow up NAFTA over the WTO challenge, but Canada should brace for some bilateral retaliation. Meanwhile, his office isn't interested in the Canadian progressive trade agenda — entrenching Indigenous, gender and workers' rights issues in the pact — because it has the whiff of Canada dictating social policy to the United States, Goldfeder said. Lori Wallach, the director of Public Citizen's Global Trade Watch, a group normally at odds with the Republicans, was also critical of the Canadian posture. "Canada is 100 per cent not engaged. Mexico started engaging in the last month or so," said Wallach, who knows Lighthizer. "Probably after the Montreal round, that increases the prospect that there could be a notice of withdrawal." Ottawa is defensive. The characterization of Canada as obstructionist is nonsense, and the product of strategic leaking of information, according to another official familiar with the content of talks, and who agreed to speak anonymously citing the sensitivity of the ongoing negotiations. The official said Canadian and American negotiators, as well as their Mexican counterparts, know each other well and are working methodically in the 30 separate negotiating rooms to make incremental progress. The official pointed to Freeland's Jan. 11 comments at the Liberal cabinet retreat in London, Ont. as evidence Canada is doing some "creative thinking" about how to deal with "unconventional" U.S. proposals. The complaints about Canada's progressive trade agenda are also a bit rich, the official said, because the real obstacles are more fundamental — the American poison pill proposals that wouldn't fly in any trade negotiation. In particular, the official cited the U.S. proposal to ditch the dispute resolution mechanism, saying Americans remember full well that former Progressive Conservative prime minister Brian Mulroney considered that idea a deal breaker during the original Canada-U.S. free trade talks in 1988. Freeland told CTV's Question Period on Jan. 21 that the progressive chapters on labour, gender, environment and Indigenous issues are not a problem. She said the Indigenous chapter would be discussed for the first time in Montreal. Assembly of First Nations Grand Chief Perry Bellegarde said it's about time — he has pushed Freeland hard on the issue in recent months as part of her NAFTA advisory committee. Bellegarde told The Canadian Press he hopes the Americans and Mexicans support a chapter affirming Indigenous Peoples' inclusion in the economy. "Canada is supporting that," he said. "Tuesday will be the first formal response by U.S.A., Mexico to that new chapter, and so it's very important." Today's NAFTA talks are unusual because Canada is being told it needs to give up benefits or lose access to its fundamental trading partner, said Eric Miller, head of the Rideau Potomac Strategy Group in Washington. "Canada's economic livelihood is on the line," said Miller, a former Canadian official who worked on the auto bailout. "One should expect Canada to be very focused on it, and to react very strongly."